QUALITY HERBAL BLENDS FOR YOUR HEALTH! Herbs are concentrated foods that provide vitamins, minerals and other nutrients that sustain and strengthen the human body. They have been used by man since the beginning of our existence and have passed the test of time. History is an excellent source of herbal knowledge. 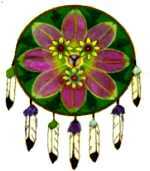 Native American folklore is rich with medicinal cures and remedies, all found in plants, roots, barks and berries. Although the medicinal value of herbs has been documented since the beginning of mankind, in recent years, governmental and medical authorities (along with modern drug companies) have chosen to replace these older, natural and often safer home remedies, with more costly, more potent, and sometimes more dangerous synthetic drugs. Since the present authorities no longer recognize the medicinal benefits of natural herbs, even though skilled herbalists have been using them successfully for many years, we can no longer make claims in regard to health benefits and therefore must offer these formulas as "food supplements" only. These formulas are not intended as a replacement for sound medical treatment and advice, but rather can be used as an adjunct thereto. Today's health-conscious public is now realizing that herbs, in conjunction with a proper diet and exercise program, can help them achieve good health. When used properly, herbs are not habit-forming and they don't build up in the body. Herbs are a natural path to good health!!! At Cherokee Valley Herbs & Medicinals, we have developed balanced herbal formula's for the health and benefit of consumers. EXCITING NEWS!!! Besides our great tasting medicinal herbal teas (now available in tea bags) and our convenient, ready-to-use capsule formulas, Cherokee Valley now has a wonderful line of medicinal creams, cordless heating pads, lip balms, bath salts, treasure candles and many more products to choose from. We use only the finest herbal ingredients in our formulas. All our products are 100% all-natural and contain no chemicals, preservatives, fillers or additives. CHEROKEE VALLEY'S WRITTEN GUARANTEE If, for any reason, you are not 100% satisfied with any of our products, simply return the unused portion within 90 days for a full refund. Customer satisfaction is our top priority -- Guaranteed!!! CHEROKEE VALLEY HERBS & MEDICINALS and its shield logo are registered trademarks. All formulas and materials contained in Cherokee Valley's web pages are copyright protected.